Bitcoin futures were made available during late 2017 by CME, such instruments have been available for trading on the CBOE Futures Exchange, LLC (CFE) as well. The trading in CBOE bitcoin futures have been unveiled by CFE under the ticker symbol "XBT" (contract specifications fact sheet.) This facilitates numerous benefits to the traders, such as, efficient price discovery, deep liquidity. transparency, and centralized clearing. XBTfutures provides a centralized marketplace for participants to trade based on their view of bitcoin prices, gain exposure to bitcoin prices or hedge their existing bitcoin positions. 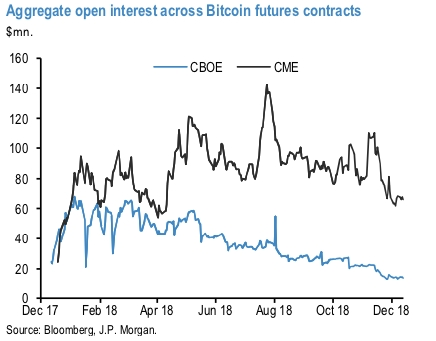 Participation by financial institutions, proxied by Bitcoin futures volumes in CBOE and CME, has declined also. As Figure 15 shows, open interest in the CME contract, where futures activity has increasingly concentrated, has declined to $65mn this week, at the very low end of this year’s range (refer 1stchart). The open interest in the CBOE contract continued its downtrend to the lowest level since inception. More importantly, the futures volumes as a proportion of trading volumes on bitcoin exchanges has declined to below 1%, the lowest level since the beginning of the year and well below the 10% high seen in the summer (refer 2ndchart). Currency Strength Index: FxWirePro's hourly BTC spot index is inching towards 136 levels (which is bullish), and hourly USD spot index has bearish index is creeping at 37 (mildly bullish) while articulating (at 10:11 GMT).